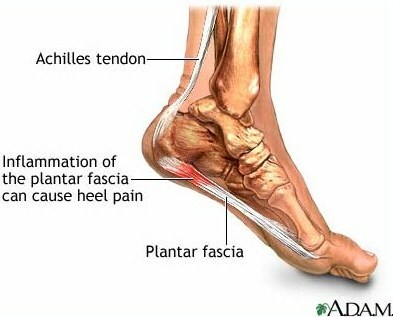 Plantar fasciitis is an inflammation of the plantar fascia, the tissue on the sole of the foot. It is often caused by overuse of the plantar fascia or arch tendon of the foot. The two ends of the tendon attach at the bottom of the toes and at the front of the heel bone by means of fascia, a strong fibrous membrane. The plantar tendon keeps the arch of the foot from flattening completely when the foot carries weight, providing cushioning and shock absorption when you’re walking, running or standing. This tendon also allows you to point your toes. Causes of the plantar fascia are made by leg movement that creates a pull on the Plantar tendon. Walking or running up or down hills, climbing stairs, walking or running on your toes which also includes wearing high heels, or dorsiflexing (pointing your toes up as your heel comes down with each stride) all pull the plantar tendon. 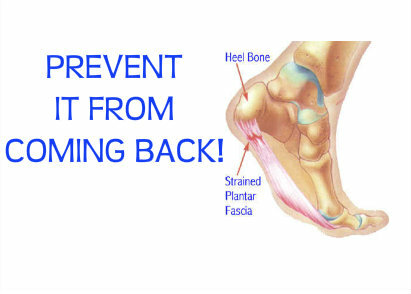 Plantar fasciitis can also be caused by heel striking, which is usually a result of over-striding. If you reach forward with your legs with each stride, you’re very likely to land on your heels. Landing in this way can create a lot of force on your heels. Tight calves and an inflexible Achilles tendon can also pull the plantar tendon and weaken the attachment of the fascia to the bone. I know days when I don’t stretch or warm up my calves properly my plantar fasciitis starts to bother me. If the plantar tendon is stretched beyond what the fascia is capable of holding, the fascia forms micro-tears and begins to pull away from the bone, causing inflammation. When the plantar tendon is constantly over-stretched, the body begins to add calcium where the attachment between the tendon and the heel bone takes place. Over time, enough calcium is added to build more bone mass in that particular spot, creating a heel spur that can be even more painful than plantar fasciitis. Have you ever had that pain at the bottom of your foot? Feel like there is a little ball you keep stepping on? Wake up and put your feet on the ground and the pain drops you to your knees?? An uncomfortable tight feeling by your heel? Welcome to Plantar fasciitis! Good thing is, you can treat it and heal it, and prevent it from coming back. Check your running form. 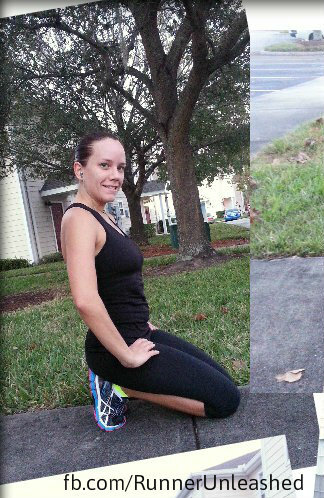 Many runners tense up their body while running, lower legs being one of them. Make sure your lower legs are relaxed, including glutes and calves. Learn to make a mid-foot strike. The body has a natural form of hitting heel first, but that causes more overall problems when running, such as shin splints. Try to train your feet to hit mid-foot, this keeps your Plantar tendon relaxed and reduces the impact to your heels. If you are having pain while running, decrease your distance until the pain subsides, I personally don’t think you need to stop running completely, but don’t try to run your usual as it can make pain worse. Just lessen the amount of time running. Having the proper shoes for your foot type is crucial. If you run in shoes that don’t support your foot type (overpronation, underpronation..) it can hurt your performance. Having tight, inflexible a Achilles tendon and calf muscles can cause stress on your plantar fascia. Stand facing a wall an arm’s length away. Keeping your lower legs and ankles completely relaxed, lean into the wall by putting your hands on the wall directly in front of your shoulders and lowering yourself toward the wall. Stand on a curb facing away from the street. Rest the middle of the affected foot on the edge of the curb with your heel extending out beyond the curb. Keep the healthy foot completely on the sidewalk for stability. Slowly lower your heel enough to give your Achilles tendon and calf muscle a good stretch. dorsiflex the affected foot (point your toes toward your knee) as often as you can remember to do so. This stretches your calf and Achilles tendon and will ease foot tenderness. You can do this stretch throughout the day while sitting. A stretch I LOVE to do, and is very effective is sitting on the floor on my knees, and resting my glutes on the heel of my feet. You can feel an immediate stretch on your plantar fascia. I usually do this for 30 seconds before and after running. Scrunch towels, or pick up marbles, balls with your toes(also a great stretch for shin splint pain). Get a deep tissue massage, or roll on a foot ball to break up the scar tissue. Using ice to roll on (bottle of water, or frozen dixie cup) is very soothing, similar to the “mini ice bath” but you are getting a massage at the same time. FOAM ROLL!!! yes the foam roller is awesome for this too!!!! put the foam roller against the wall, and put your toes against it until you feel the PF stretch, hold it for as long as needed. You can alsouse the foam roller on your calves. If the muscle from your leg is relaxed, it will ease the pain on your foot. Use the roller on both calves to relieve the tension. I hope there was something useful in here for you,from experience the foam rolling and of course KT TAPE has helped over come this pain. I sometimes wear arch support socks to help ease the pain while running. 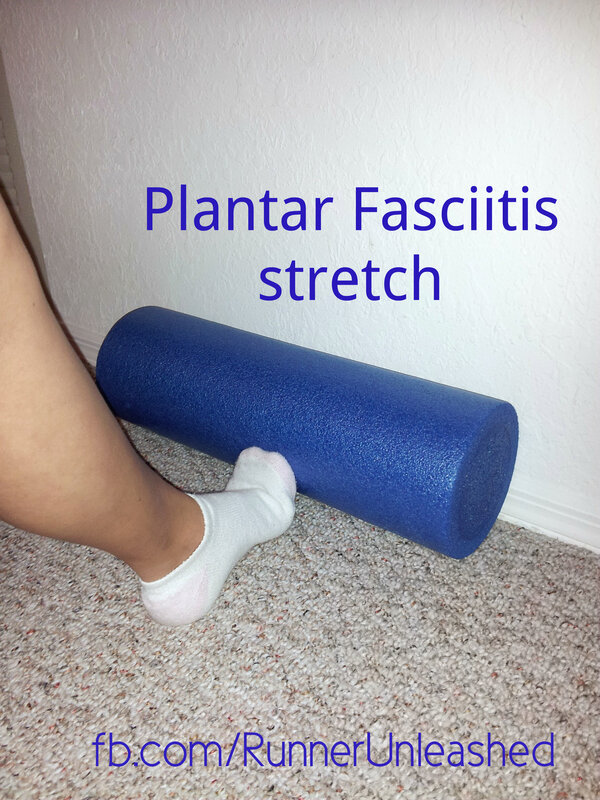 But when I do the stretches before and after I run, I am able to avoid having my plantar fasciitis act up!! So good to see a positive attitude to this. Most info has said stop running, ice it, stretch it and rest which I did for 3 miserable weeks but it hasn’t made much difference. I ran 2 days ago for first time and it was no better/worse than before. I’m going to change shoes and give the roller ago. Thanks for info. Sorry, i did not get it properly. I have PF (young development according to X-Ray), feeling pain only overnight when i get up or start walking after long sitting. Can i actually run? Would this worsen the PF. Thank you!. Lots of good stretching techniques. I’m going to look into those, maybe make a similar post about its effect on other runners. Thanks! So, I guess KT tape is like a compression sock, then? I wonder if it’s actually beneficial as I’ve seen no studies on its efficacy. PT seems to be caused by a calcium deficiency also. I am certainly no expert, so do your own research, but I knew I have a calcium deficiency because I am lactose intolerant and I can see this white marks in my finger nails from low calcium. I read some interesting articles about PT and calcium and immediately went out and bought calcium supplements. It seems to be working. I went from limping really bad and being in pain to hardly any pain and no limp in two days. I am not ready to start running yet. But I am optimistic that I will be able to soon. I appreciate the info about relaxing and focusing on my form. 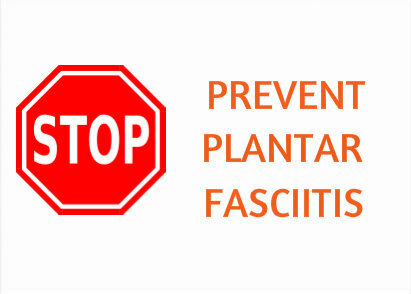 I meant PF, not PT… planters fasciitis. Would you be able to tell us more about your experience with KT tape? I am not completely sold on the benefits. But I’ll gladly write a new one. Taping your foot is great as it provides a little extra support to help prevent against over straining. A lot of people swear by it but others just doesn’t do the trick. I would recommend trying it. For $15-$20, definitely worth a try. Thanks for this article! I recently wrote one myself on the dangers of running with plantar fasciitis. I had to learn the hard way because I continued to try and run even after I first noticed the pain in my foot. Hundreds of dollars later I am finally back to 100 percent, and I now know the importance of good shoes and stretching. I’m lost at what sandals or shoes to buy. Spent hundreds and hundreds of dollars in the best, good for a while then comes back. 3 Rd year now😢I ice I stretch I foot bath every night nearly with e salts. And I’m not a runner. I stand and walk every day in my job, I go to gym 3/4 times a week. Over the last 3 years I have gained about 10 kg even though good eating and gym. But it since I’ve turned 50. Hi Pete – I’m a new follower, and really enjoyed your post on PF. I’ve had a chronic case of PF for many years, and just recently overcame it with lots of stretching of calves and hamstrings. I agree with you that stretching out the entire leg is critical for resolving it. Thanks for the great information! Hi…. I had a question here. The PT occurs due to pull on the plantar tendon but then how does standing on the edge of the curb/stair help in healing? Isn’t the tendon getting pulled further? Also, will complete rest (just heading to office and back) help in healing the tendon? Great post this is exactly what I did one year ago and it went completely away. I been having this pain for a while and decided to find out what was causing it. I found this site, and the pain went away instantly. Some great stretching exercise tips here! Another thing that’s helped me is calf strengthening exercises. This is very helpful. I will definitely try KT tape. 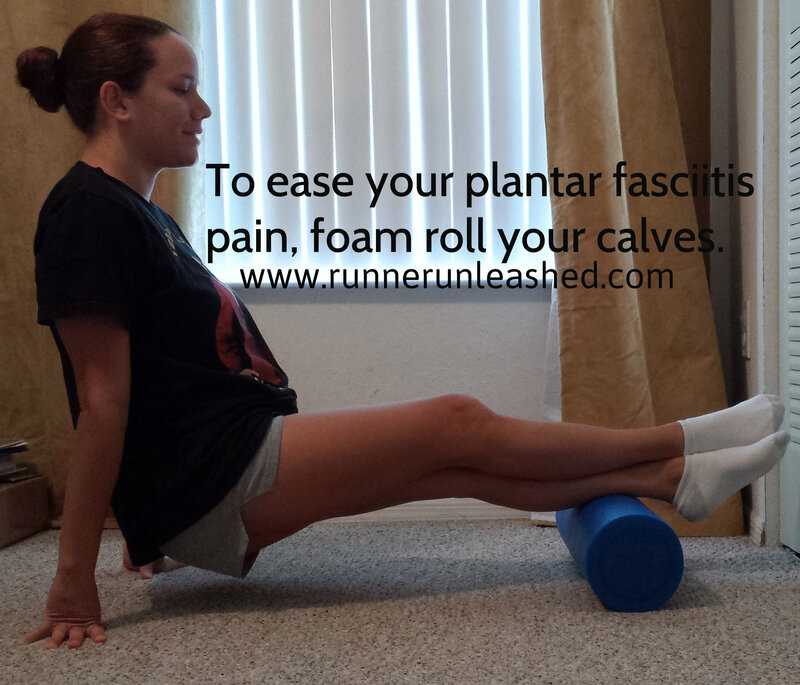 One thing I have noticed is a lot of articles say runners get plantar fasciitis, but I’m not a runner and got it. I must have really pulled it while walking, lol. Previous Previous post: I’m not Goofy, or Dopey yet…but cutting it real close!! !